Breathtaking unobstructed Gulf views await at this exceptional 2BR/2BA beachfront condo. Enjoy a cup of coffee on the private balcony as the sun rises over the water, and gather with your group for an al fresco meal as the day ends. A welcoming color palette and plush furnishings make this updated condo the perfect beachfront getaway for up to six guests. The Suntide II condominiums feature private beach access, with the shore just steps away. Other amenities include a heated beachside pool, a hot tub, beach volleyball, and a truly Texas-sized BBQ area. Walk to nearby dining and entertainment venues. Shades of sand and sea give the living room a tranquil, coastal vibe. Relax on the sleeper sofa, love seat, or recliner and enjoy a beverage after a day in the sun. Later, settle in for a movie on the 50” flat screen TV, or stream to your own devices thanks to complimentary Wi-Fi. The spacious well-stocked kitchen has everything you may need to whip up delicious home-cooked meals. Six can gather at the high-top dining table, with seating for three more at the kitchen bar. The spacious master bedroom offers a tranquil retreat. 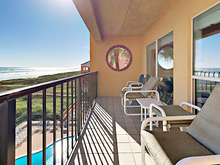 Enjoy views of the crashing waves from the king-size bed, or watch a movie on the 32” flat screen TV. The en-suite bathroom features a beautifully updated tile walk-in shower and a separate vanity area. At the opposite end of the condo, you’ll find a guest room with a queen bed, 32” flat screen TV, and an en-suite bathroom with a tub/shower combination. Guest amenities include complimentary Wi-Fi and an onsite coin-operated laundry. Guests will receive one parking pass, and additional spots are available on the street. As a guest at Suntide II Condominiums, you’ll be treated to private beach access, with the shore just steps away. Forgot your beach towel or need a nap? No problem—your condo’s proximity to the beach makes it a breeze to go back and forth. You’ll also enjoy Suntide II amenities like a heated beachside pool, a hot tub, a sun deck with palapas, a tennis court, beach volleyball, and a large BBQ area. For seafood and happy hour specials just down the street, swing by Blackbeards’, a neighborhood mainstay since 1978. After dinner, head across the street to pick up an ice cream at Dolce Roma. Or stop by WannaWanna (10-minute walk) for pub fare, live music, and frozen cocktails on a beachfront deck. Adventurers can check out South Padre Island Watersports (5-minute drive), where you can rent bikes, kayaks, paddle boards, and more. And Schlitterbahn Waterpark is just a 10-minute drive away. For quick grocery pick up, you’re just a mile from Blue Marlin Supermarket.